I recently spoke about a topic that has increasing importance in the field of facial plastic surgery and I want to sum up a few of those concepts here. 1. Surgery of the aging face began with removal of extra, loose skin but has made great advances as we learn more about facial aging. Suzanne Noel, one of the female pioneers of plastic surgery, circa 1918. Since the first facelift was performed in 1901, the surgery has mainly focused on excision of excess skin. With the invention of SMAS and deep plane facelifts in the 1980’s, more emphasis was placed on deeper structures of the face. In the 2000’s, the shift was made to emphasize volume replacement. Some refer to this period as the “Volumetric Period”. 2. Changes below the skin lead to volume loss – including our facial skeleton. 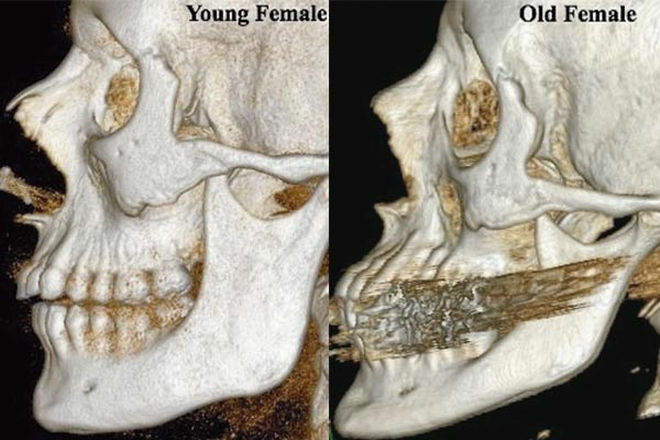 Skeletal changes in the aging face. There is loss of volume of all layers below the skin, including the bone, muscles, and fat which can be quite significant. Imagine the same amount of skin covering both skeletons that are shown. Simply losing that degree of bone volume would result in a large amount of skin and soft tissue sagging. Replacement of volume at the level of the facial skeleton is first performed to provide a foundation. I am using injectable fillers for the majority of these cases, but facial implants (silicone) are also used for augmentation of the chin, cheeks, and temples. There are significant changes in the fat below the skin. Early changes make fat below the eyes more prominent – as the cheek fat descends. This continues which causes hollowing in the cheeks and prominence of the folds around the nose and mouth. Replacement of lost fat volume is generally performed with injectable fillers or from fat injections. The ease of use and safety of injectable fillers is partly responsible for their rapidly growing popularity. Fat injections have the benefit of taking the patient’s own fat and allowing large volume replacement. Not only do we lose volume, but as we also know, we lose skin elasticity which causes loose skin. This leads to wrinkling and sagging of the skin. It is important to address excess skin laxity at the time of volume replacement for the most natural results! In summary, there is a complex balance in order to obtain natural results. Come in for your complimentary consultation to discuss which options are best for you! Have a great week.